No matter how you measure it, the “movement” was not as historic as Trump proclaims it to be. Trump’s electoral college win, meanwhile, was a squeaker. Trump had narrow victories in three key states (and narrow losses in two others). He won Michigan by 10,704 votes, Wisconsin by 22,177 votes and Pennsylvania by 46,435 votes. So if 39,659 voters in those states had switched their votes, 46 electoral votes would have flipped to Clinton — and she would have won 278-260. Trump repeats a problematic talking point about crime and poverty in “inner cities.” It’s unclear what he means by “inner cities,” which is not a category by which crime or poverty is measured. As for subsidizing the armies of other countries, Trump appears to be referring to military bases that the United States has overseas. A 2013 Senate report found that the United States spent $10 billion a year on bases abroad, with 70 percent focused on three countries — Germany, South Korea and Japan. Germany is the center of European defense obligations, while the troops in Japan are the core of U.S. projection of power in Asia. The troops in Korea deter an attack by North Korea. Given a defense budget of more than $500 billion, the cost of maintaining these bases is a mere pittance. The United States doles out about $6 billion a year in foreign military financing, with most of it going to just two countries: Israel and Egypt. But this money comes with a catch — most of it must be spent on U.S. hardware, creating jobs for Americans. As for the “very sad depletion” of the U.S. military, this is hyper-exaggeration. One can argue about whether the military budget should be boosted, but there is no question that the U.S. military is stronger and more capable than any other nation’s. The website Globalfirepower.com ranks countries based on 45 factors, and the United States tops the charts. Here’s one small statistic: The United States has 19 aircraft and helicopter carriers, as of the end of last year; no other country has more than four. Trump appears to be referring to U.S. involvement in military adventures, such as the 2003 Iraq invasion he supported, and possibly foreign aid. Foreign aid amounts to less than 1 percent of the U.S. budget, with about $18 billion going to economic and development aid and $8 billion for security assistance. Even the Marshall Plan advanced by President Harry S. Truman, designed to stabilize Europe after World War II, was only a little over $100 billion in today’s dollars. Contrary to Trump’s rhetoric, the United States is far wealthier than other nations. According to the International Monetary Fund, the United States has a gross domestic product of $18 trillion, one-third larger than that of China, the nearest rival and a frequent target of Trump’s attacks. 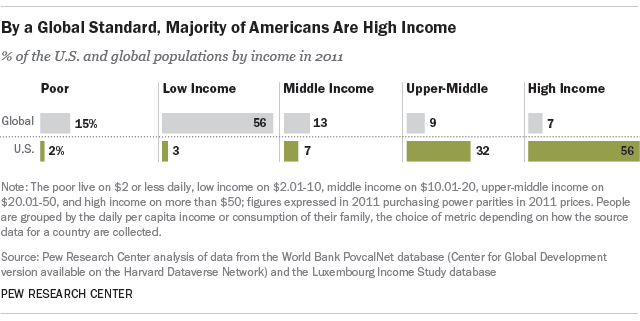 A Pew Research Center analysis found that the vast majority of Americans are either upper-middle income or high income; many Americans who are classified as “poor” by the U.S. government would be middle income globally. The number of U.S. workers engaged in manufacturing is now about 12.3 million, up from 11.5 million in 2010, after the Great Recession hurt many manufacturers. But that’s still a decline from about 17 million in the 1990s. Some analysts calculate that between 1 million and 2 million U.S. jobs were lost after China was admitted to the World Trade Organization in 2000. But economists believe the biggest factor in the decline in manufacturing is automation, not jobs going overseas. Another factor is decreased consumer spending on manufactured goods. A new report by the Congressional Research Service notes that “employment in manufacturing has fallen in most major manufacturing countries over the past quarter-century,” so the U.S. experience is not unusual. Meanwhile, the official unemployment rate is 4.7 percent, down from a high of 10 percent in the aftermath of the Great Recession of 2007-2009. Jobs have been added for a record 75 months. Trump continues to attack companies that ship jobs overseas, and has promised to keep jobs in the United States. But Trump has had a long history of outsourcing a variety of his products as a businessman, and he has acknowledged doing so. We know of at least 12 countries where Trump products were manufactured. Further, Trump products transited other countries through the packaging and shipping process — meaning that workers in more than 12 countries contributed to getting many of Trump’s products made, packaged and delivered to the United States. Here’s our inventory of Trump’s products made overseas. Meanwhile, Trump is apparently unaware that participation has declined in means-tested programs such as Temporary Assistance for Needy Families (TANF) and the Supplemental Nutrition Assistance Program (SNAP, formerly known as food stamps). in the inaugural address, Washington D.C.